The Symphony® is a trusted choice in thousands of hospitals worldwide, thanks to its proven quality and reliability. By mimicking nature, its unique suction patterns support mothers to initiate, build and maintain adequate milk production over time.¹⁻³ The PersonalFit™ PLUS pump set further enhances Symphony®‘s performance by improving the comfort and efficiency of each pumping session, helping mothers express more milk in the same time⁴ and delivering next-generation ease of use and simple cleaning.⁵ Together, Symphony® and PersonalFit™ PLUS optimise expression throughout the infant’s hospital stay and beyond. These stages are interrelated, so it is important to get things right from the start. The Initiate stage between birth and secretory activation is critical for future milk production. When breastfeeding is impaired, stimulating the breast by starting pumping within the first hour after birth, rather than in the first six, can lead to significantly increased milk production later.¹⁰ During the Build and Maintain stages, if the infant is not able to breastfeed, or cannot remove milk effectively, pumping replaces or supplements breastfeeds. Around 40% of mothers are at risk of delayed secretory activation (where milk comes in after 72 hours).¹¹ These mothers are 60% more likely to stop breastfeeding at four weeks,¹² with many citing insufficient milk as the reason.¹³ Such challenges could be overcome if mothers were supported with initiation in the first few hours and days after birth. Such challenges could be overcome if mothers were supported with initiation in the first few hours and days after birth. 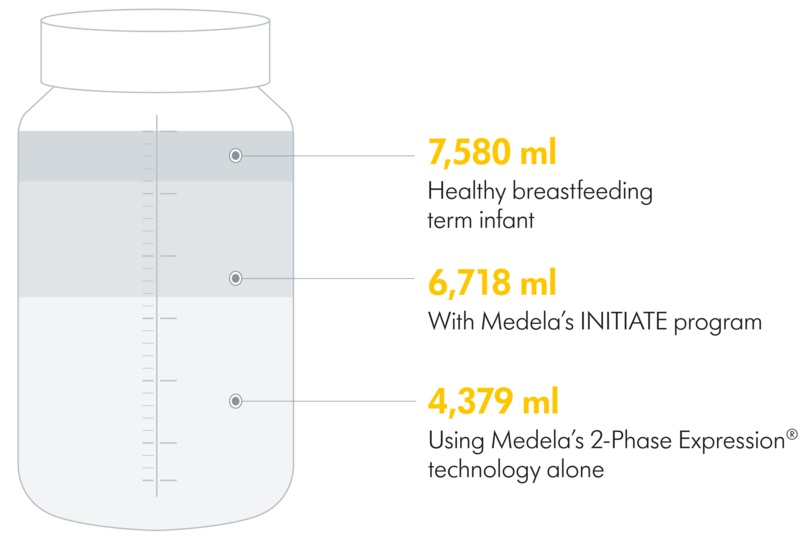 The programs are based on Medela’s extensive research into infant feeding behaviours. It is not just mothers’ milk production that follows a continuum: infant feeding patterns do too. In the early post-birth period, a newborn’s time at the breast consists largely of ‘non-nutritive’, stimulating sucking. This is interspersed with short bursts of ‘nutritive’ sucking to gain small amounts of colostrum, plus pauses.¹⁴ The INITIATE program mimics these irregular sucking and pausing patterns. To benefit from these programs, a mother needs the right pump set. This is where Medela’s latest innovation, the PersonalFit™ PLUS pump set for Symphony®, really makes a difference. 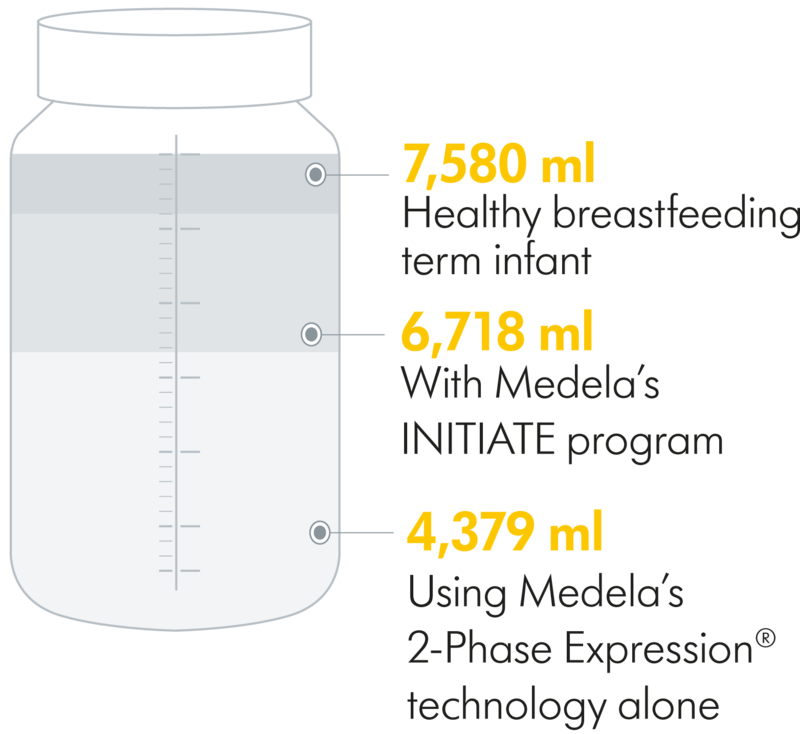 Medela has continuously set industry standards since launching its first hospital-grade breast pump in 1980. The arrival of the research-based Symphony® in 2001, with its 2-Phase Expression® technology, heralded the start of a new era in breast milk expression. It raised the bar further in 2009, releasing the first version of its unique Initiation technology. Now PersonalFit™ PLUS is the latest innovation to set new standards in pumping performance.